The MicroResp™ system requires calibration for individual laboratories to take into account different spectrophotometers that are used, different types of soil or other environmental samples, and incubation conditions. The conversion of Absorbance to %CO2 is a non-linear relationship and the best fitted curve (regression analysis) is used to obtain the formula and parameters. There are various ways to carry out the calibration. The Detection gel is incubated with varying CO2 concentrations for a period of time and then measured on a microplate spectrophotometer reader. The incubation time and temperature should be the same as that of your experiment. In our case MicroResp™ was carried out on soils incubated at 25oC over 6 hours. 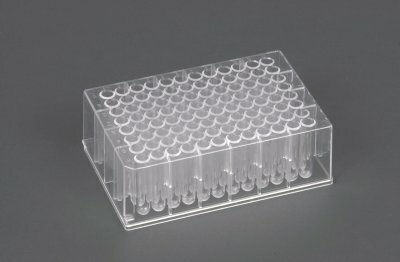 Assembled 1 x 8 well breakable strips in a microplate frame are filled with the detection gel. These can be broken (usually into a strip of 4 wells) and placed into a sealed jar or suitable container for the measurement of CO2. Duran® bottles (or similar) containing various volumes of soil (or a variety of soils with different respiration rates), with a Microstrip of 4 wells (and detection gel) are sealed with a rubber bung for a set time, and incubated at a constant temperature. After incubation a sample of CO2 is removed and measured on a GC. The bung is then removed and the strip of wells inserted into the carriage plate and read on the spectrophotometer. To obtain a range of %CO2 and absorbance values it is advisable to use a range of samples with varying respiration rates and/or differing amounts of the sample. Containers filled with different concentrations of %CO2 could also be used to calibrate the system. Treat known quantities of metal carbonate (e.g. CaCO3) with an excess of dilute mineral acid to produce known quantities of CO2 (equation: CaCO3 + 2HCl → CaCl2 + H2O + CO2). This can be achieved with a sealed jar containing the carbonate and a small vial of dilute acid, and with a MicroStrip of 4 wells attached to the side of the jar. Then agitate the jar to tip the vial containing the acid onto the carbonate, ensuring that the carbonate or acid do not come in contact with the gel. A jar containing just acid and the detection gel would be required to ensure that there has not been any effect from the acid itself. Alternatively, you could use IRGA or alkali trap and also any method using fixed CO2 concentrations could be used, e.g. standard gases from a cylinder. Reference: Rowel, M.J. Colorimetric method for CO2 measurement in soils. 1995. Soil Biology & Biochemistry 27, 373-375. All images on this website are copyrighted to The James Hutton Institute.